With extra innings looming and the shadows sweeping across Fenway Park, Dustin Pedroia stepped to the plate with two outs to face Jonathan Broxton, who had just entered, for the first time in his career. It was his situation, his moment, a chance for 5 feet 9 inches to measure up to 6 feet 5 inches. And Pedroia converted, lining a two-strike single into right field to bring Daniel Nava sliding headfirst across home plate. The celebration, brought on by the Red Sox’ fifth straight win, 5-4 over the Dodgers yesterday, began with Nava, continued to Pedroia’s position on the base paths, and ended all the way in right field, which earlier had been the site of miscues and disappointment. “To be honest with you, it’s kind of survival,’’ Pedroia said. “He threw me some pretty tough pitches. It’s not fun when you’ve never faced a guy like that before, and he’s throwing 100 with that second pitch. Honestly, when I got two strikes, I was just trying to put the ball in play and I hit it on the barrel. That he did, providing the first walkoff hit of his career. The inning had started off well, as Bill Hall, trying to gain the forgiveness of the 37,454 in attendance after making two errors in right field, singled up the middle. Nava, one of the hottest hitters on the club, laid down a poor sacrifice bunt, erasing Hall. But after Darnell McDonald struck out swinging, Marco Scutaro walked. That left it up to Pedroia. While he wasn’t successful yesterday, it all worked out in the end with Nava scoring the winning run from second base, continuing to play far above his pedigree. Not that the Sox didn’t have chances earlier. After the Dodgers had tied the game, 4-4, in the seventh inning, David Ortiz stepped in to face lefthander Hong-Chih Kuo with two on and two out. Lefties had yet to get a hit off Kuo in 21 at-bats this season, and Ortiz made it 0 for 22 with a swinging strikeout. The Dodgers also had a late scoring chance when the rejuvenated Garret Anderson singled to open the ninth against Jonathan Papelbon, then Jamey Carroll bunted pinch runner Reed Johnson to second. But Papelbon, who was working on his secondary stuff, got Blake DeWitt to ground to first and Matt Kemp to fly to center. The Sox committed four errors, and the most damaging was the second of two made by Hall in right field. In the seventh, he let a double by DeWitt get past him in the corner. Anderson scored from second and DeWitt landed at third, ending the day for starter Tim Wakefield. Kemp followed with a sacrifice fly, the run charged to Wakefield. Wakefield gave up four runs (three earned) over 6 1/3 innings, striking out six and walking just two. He tied Roger Clemens for most starts at Fenway Park with 200. 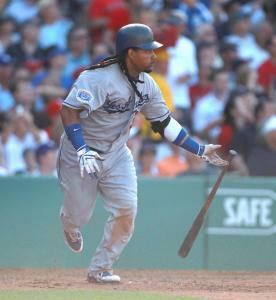 But Wakefield couldn’t quite contain Manny Ramirez. The Dodgers’ designated hitter knocked a solo homer into the Monster seats with one out in the sixth inning. Earlier, Ramirez, who stole just seven bases in 14 attempts in his eight-year tenure in Boston, stole one off Wakefield after singling to open the second. When Ramirez’s stolen base came up, Wakefield clapped and said, “Congratulations.’’ Clearly, he was having no part of it. The Sox are the majors’ highest-scoring team (5.5 runs per game), and they haven’t had any trouble generating runs in interleague play. Their first run yesterday came on Nava’s double in the second inning. Their next three runs came on long balls. After Kevin Youkilis singled in the fourth, Victor Martinez blasted a homer into the visitor’s bullpen, giving the Sox a 3-1 lead. Youkilis donated a sixth-inning pitch to Lansdowne Street, his solo shot chasing starter Vicente Padilla. It would take until the bottom of the ninth, but the Sox pulled through. Their first walkoff win since April 21, courtesy of the feisty second baseman, added to the best record in baseball since April 20 (38-19).